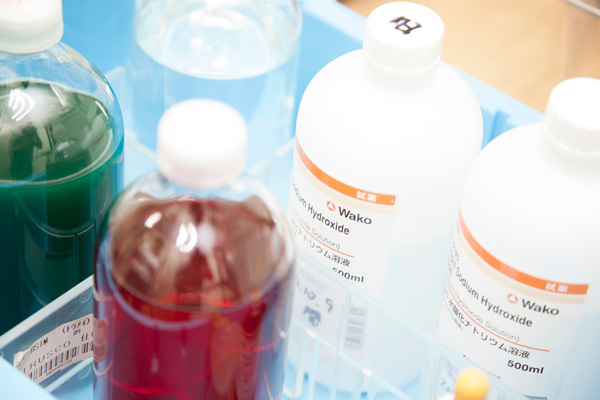 An analytical laboratory equipped with various different types of analytical equipment and instruments has been set up by the Maruzen Group in order to provide clients with an integrated package of services. Services based on the provision of chemical analyses are offered. We perform analytical functions according to requests made by clients. Analyses, including the periodic analyses of samples taken of products contained in tanks and analyses performed prior to the acceptance of ship and ISO containers, can be carried out as requested by clients. In addition to tank analyses, we also perform pretransfer analyses and other types of analyses and sampling actions on products stored in drums and cans. Such actions are carried out by employees who have received specialized education in this field. In April 2016, the Chiba office (Ichikawa Office) of Shin Nihon Kentei Kyokai set up shop on our premises. This enabled the provision of rapid survey operations.